Valentines Day. I'm not a fan and I can't escape it. You get bombarded with images of cupid, loved-up couples and it makes me feel a little nauseous. I don't mean to be a party pooper but I find it all really annoying. Despite my feelings on Valentines Day I'm going to try and embrace it as well as I can for a singleton and this year I'm going to Take My Breath Away: Valentines karaoke with some of my best friends and I'm going to get really dressed up and have some fun. I'm even going to try and not roll my eyes when I see couples holding hands. I've actually bought this dress, yes another plain jersey dress from Topshop BUT they are are so easy to wear and go with everything so I'm allowed ok? I will be wearing this to karaoke on Thursday with anything red or pink that I can find in my wardrobe for an over the top Valentines look. I love this O.P.I polish and I'm going to hit Boots and Superdrug tonight to look for a dupe to save a little money. I'm loving Next homeware at the moment and this heart shaped light is on the way to my house ready to be hung over my bed. I already have fairy lights in my room but I don't think you can ever really have too many fairy lights. I've been lusting after a Zatchels bag for ages to take to festivals and on nights out. These ones are the perfect size for some cash, lippy and your phone and are real leather so would last a lifetime. I've got some M&S pink bubbly in ready for some pre karaoke drinks because I need some dutch courage before screaming Bonnie Tyler's - Total Eclipse of the Heart in front of strangers. I already have a 'G' ring and star ring from Daisy and I think the heart one would make the perfect addition to my collection. These are really dainty in person and I wear my initial ring everyday. 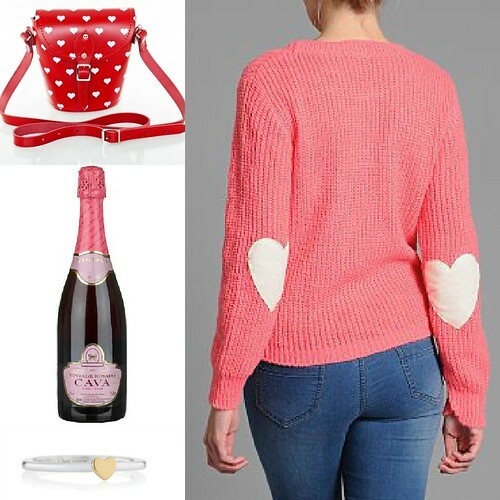 I love this adorable jumper from Bank, the heart patches on the elbow are amazing and I would get this out for Valentines Day each year. Whatever you're doing on Valentines day I hope you get to spend it with people you love and have a jolly good time! I love those shoes, I followed the link to see if I could buy them straight away but alas, not in my size. I fell head over heels for the satchel version of that bag but it's way out my prices range as is the OPI polish which if you do find a dupe for PLEASE share it! Hope you have a fun night, you will look amazing in that dress!